To be able to get American IP Address for free is quite useful. If you ever wanted to watch a geographic location specific Youtube video, Sports game or a latest episode of a American sitcom from CBS website from outside of USA you are blocked. Most folks would have experienced this with Netflix or Hulu. The reason is simple. The content that you are trying to watch is not ready for locations outside of America. It would either be available in a pirated form in your location or via some IP address trickery. The IP address trickery is easy. All that one needs to do is somehow make the content website (like Netflix, YouTube) believe that you are accessing the content from America. To achieve this you would need to get American IP address. The easiest way to do is to use a proxy. A proxy is a computer that sits between your computer and the content website. Every website request you make will be first made by proxy and then results will be redirected to you. The only issue here is that there are not many reliable or fast proxies available for free. Another way to get American IP address for free is to use a VPN. Again getting on to a VPN is not a straightforward task. The challenge lies in finding a network to connect on to. There are many networks available for a cost but following are the nice ones that come free of cost. 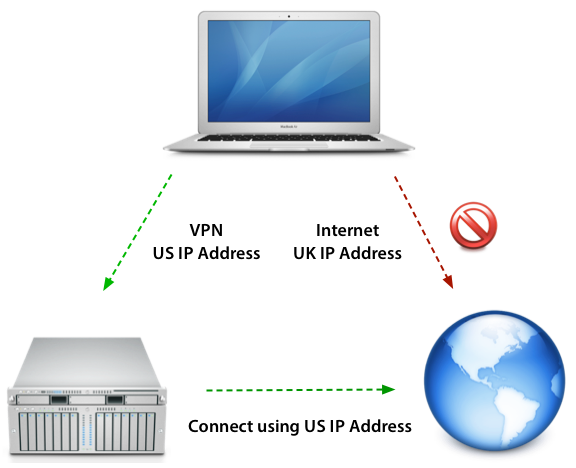 Private Tunnel: This service provide IP addresses from five different countries. And yes you can get American IP address also. The only catch here is that the free service is limited to 100MB. This works great for some low usage but high usage will require more money. HotSpot Shield: This seems to be the best option at the moment to get American IP address for free with really no bandwidth limitation. Allows unlimited watching of videos and other high bandwidth applications. The catch however is that the free version requires showing up of ads on the display. VPNBook and JustFreeVPN are two new ones that have shown up recently. They are free and do not have bandwidth limitations either. The former connects to Romania only right now while latter can get IP address from US, UK as well as Canada.